July 10, 2018, © Leeham News. 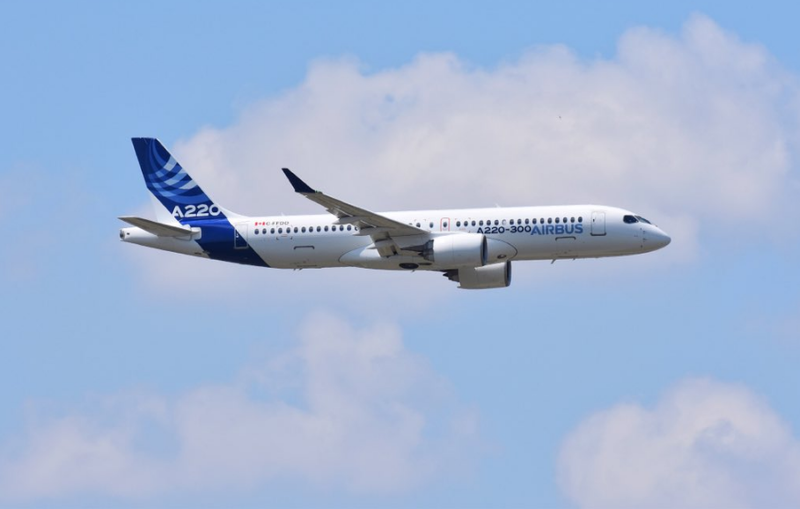 : Airbus launched its new A220 aircraft family today in Toulouse. The event took place at the Airbus Delivery Center at Blagnac airport with the World’s Media invited. 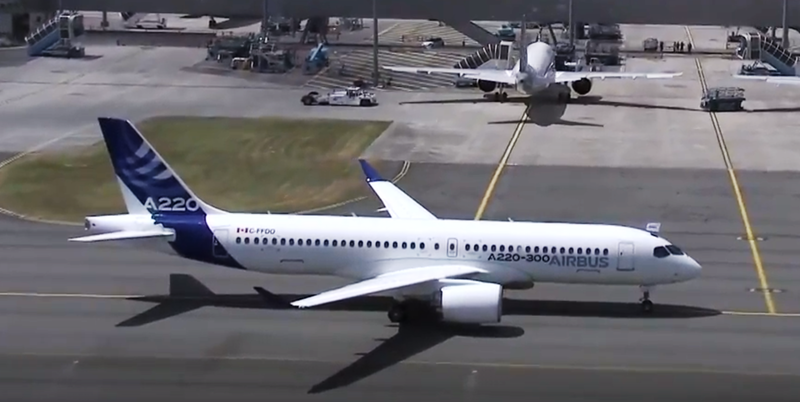 The Bombardier CS100 is now A220-100 and the CS300 is A220-300. The name of the newly branded family was revealed with a flyover of a CS300, sorry, A220-300 painted in Airbus colors and with the A220-300 name on the side. Figure 1. A220-300 which flew into the A220 launch today. Source: Airbus. We will come back with more in-depth articles about the A220-100 and A220-300 and how they fit into the Airbus family. For now, here are some pictures with comments from today’s event. The CSeries CS300 becomes Airbus A220-300. The aircraft was painted in Airbus colors and given its final name a few days before the event. The A220-300 took off from East Midland airport in the UK at 10.22 CET and made a flyover at Toulouse Airport 12.30, revealing the new colors and branding. The A220-300 then landed and taxied to the gathered press at the Airbus Delivery Center, waving the Airbus flag from the cockpit emergency escape hatch. Well parked the flight’s pilots could step out and greet the crowd. Captain was Andy Litavniks, the Bombardier test pilot who was my Copilot when I test-flew the CS300 A220-300 18 months ago. 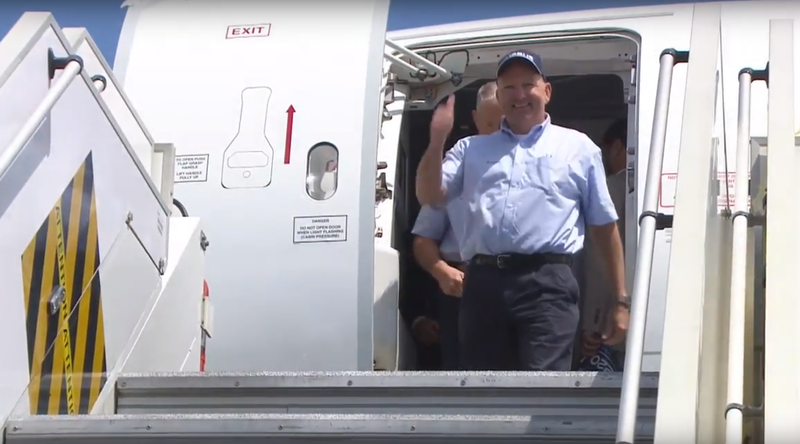 Andy wore an Airbus shirt and cap so guess he is part of the A220 joint venture now. With the CSeries joining the Airbus camp and Embraer Commercial forming a similar joint venture with Boeing, the civil airliner market goes into a new phase. July 2018 will be a point in history for the airliner industry. I am guessing Airbus will count the C series planes in their sales race against Boeing. No doubt both OEMs are/have been re-working market forecasts to accommodate recent industry developments something else that won’t help future historic comparison. [McDonnell] Douglas’s historic (commercial jet) orders are easily found on Boeing’s website in the same place that you can look up Boeing’s historic (commercial jet) orders. Airbus will adopt the C series orders, and count A220 orders. Work out a designation system and stick to it.Airbus is all over the place or maybe they are planning some extremely long variants. It makes no difference whatsoever. Airlines don’t care what a plane is called. Do no operators market 787 service as being by ‘Dreamliner…’? Thanks Bjorn, the A220-300 suddenly looks a very “confident” aircraft coming out of the Airbus stable. That day Airbus said they will support the CSeries program I saw the end of CSeries. See what happened. Airbus killed the rivalry with one shot. Good attempt Bombardier, but duopoly in aircraft manufacturing is now stronger than ever. See NEW order at end, frankly that is purely silly statement. Yes the C deliveries from here on in will be part of the Airbus delivery numbers. So will E series be added to Boeing when Embraer and Boeing have officially tied the knot. (that will be more than the C so Airbus gains no advantage. Per Airbus Branding it should be the A210 and the A230. Of course the A318 should be the A320-100 (etc), but then all those models numbers means you have more types of aircraft in production than Boeing! They missed a real opportunity here. So I guess the 100 and 300 means its not a mature product like an A350-900? I know it makes zero difference but it would be nice to see some constancy . I like Boeing’s move to single Dash numbers. Yes, I’m sure that’s exactly what it means. What a useless nitpick. Bee: Its my nitpick and I am sticking to it! That would seem inconsistent with Airbus model numbers, since the latter is a stretch variant of the same plane. Ax0-100 and Ax0-300, where “x” is any small number (i.e. 0, 1 or 2) would make sense. If the planes differed as much as the A330 and A340 (which were also co-developed), the planes might merit completely distinct model numbers. Well we have an A318, A319, A320, A321. Whats the difference? They all look alike, they all have two engines etc. I think the A319 is already being eaten as we speak. So it could have been A219 and A220. Bur A210 and A230 doesn’t make sense in the context of Airbus’s existing numbering. You can play with it all you want. Airbus keeps the A319neo as its high performace aircraft above the A220 as per the presentation. I’m glad that the racoon mask of the recent models didn’t make it onto this one. Sad day for the aerospace sector in Canada – as a Senior Engineer who worked on the composite aft fuse WP, my heart sinks…new product development in the Montreal aerospace cluster is dead (back to regionals and bizjets – maybe payload design?). Still wondering who has design authority on this program…at the very least my employee shares have gone up (small comfort since they were as high as 20$ CAD in the early 2000’s). With all sympathies its incredibly difficult for a smaller population county like Canada to produces the whole range of tech and admin needed for a Single Aisle competitor. My wife and I have had that discussion where a person today to make a decent living and retirement let alone to just stay afloat needs to be an Accountant, an Attorney, a Financial whiz as well as a trade that pays. Good luck to us all! China with all its money has failed miserably to date. What I do hope for you and your country is that Airbus sees this as a way to broaden its horizons (its proven to be quite adept at that) and Canada becomes the core for the under 180 seat aircraft industry. Having been around a long time, nothing can stop change (I don’t buy the BS its good) you can just ride the currents and hope for the best while doing your level best in the small segment you are in. Canada single highhandedly has produced an awesome aircraft in the C. Its had some great success with the iconic Otter, Beaver, Twin Otter and the Twin Amphibian fire fighter aircraft (CL?) . You all can be proud of that and you can only wait and see what the future brings. Airbus is far better than Boeing would be for you. As a Canadian I agree – a sad day for Canada. 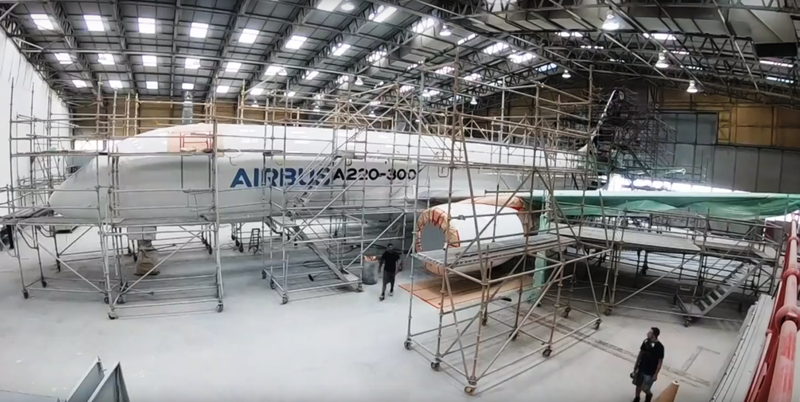 If not for the fact that some Canadian’s will continue to be employed in the program for the foreseeable future – I would rather the program collapse than fall into the hands of Airbus (for free). The salt in the wounds is the FAL in Alabama. No doubt when they break ground Trump will crow about all the jobs he “brought back” to the US from those “cheating Canadian” with his threat of 300% tariffs on Bombardier. The future for all Canadian manufacturing looks bleak. I expect next Trump will place crippling tariff’s on Canadian cars thereby destroying our auto industry since it worked so well in the aviation sector. I fear we are doomed as a country. Feel the need to respond to Kevin’s comments. I know that a lot of Canadians must feel deflated by the transfer of C Series ownership to Airbus. The JetBlue announcement, coming just hours after the rebranding is like iodine on an open sore. The reality is that Canadian and Irish engineers and laborers have accomplished a remarkable feat, in the face of almost unsurmountable odds. The commercial and defense aerospace sector is a crowded space and it was always going to be incredibly difficult for an upstart to muscle in on the commercial duopoly. Just read the Sporty Game published in 1982 – the industry dynamics haven’t changed in nearly 40 years. JetBlue noted in their PR yesterday that they are not only making a firm order for 60 A220s – they’re also upgrading A320neos to A321neos and deferring the acquisition of some of these aircraft. 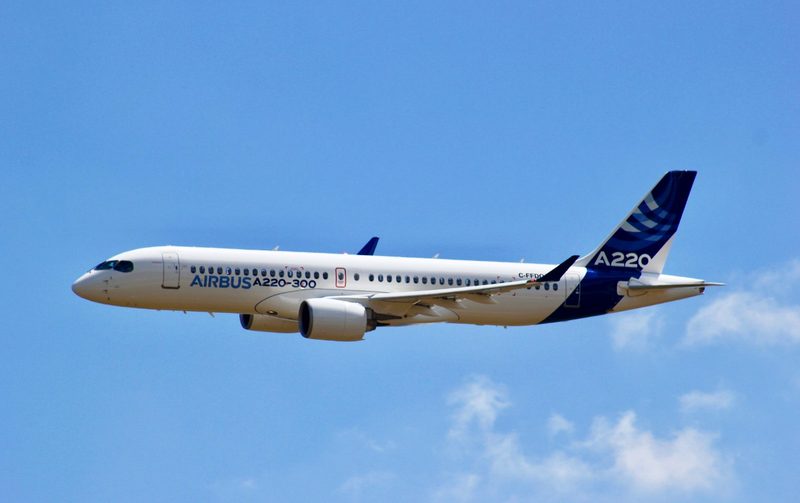 They also noted that the A220 purchase makes JetBlue an all-Airbus fleet operator. Bombardier was never going to be able to offer these kind of benefits to the large carriers. The engineering ingenuity that resides in Canada will survive – it would be better served by latching onto emerging verticals rather than well-established sectors AKA “castles surrounded by moats”. Bombardier didn’t fail with the C Series because it was Canadian – it failed because of a flawed strategy. My issue is the transparency of the CSALP and the intellectual property (and design authority). Manufacturing is a company’s bread and butter, but does Canada only want a build-to-print hub (or do you want a strategic knowledge base too). Look at Fokker and Dornier – what future does Bombardier have squeezing legacy programs, other than the C suite’s option gains (no need to discuss bizjets). We spent months/years developing our primary structure composite technology for production (design, certification and manufacturing). Canadians can provided monies to the auto sector or oil infrastructure, but aerospace funding is anathema. Funny thing is the engineering department has Canadians from coast to coast. Trump too will pass. I don’t know when of course but he is a train wreck on his way, just a matter of what takes him down not if. No where near are all Americans Trump nor do most of use believe in what he is doing. We are stuck with him (unless we want to go the way of Syria). As for Canada, its a tough row to hoe and I am hopping Airbus will turn Canada into its single aisle center over time. Personally I want to see the C survive and thrive like many of us think it should. and: There never will be a -500, at least in the sense previously bandied about in these pages. That is what this whole thing has been about since day one. A little competition in the regional/crossover niche is ok, just don’t mess with the cash cows. I have/had often my doubts about an “CS500”, guess now A220-500, but if airlines like DAL comes to AB and say they will be interested it could happen. Also, an A220-500 won’t compete directly with an C919 and MC21, so that market could open for what I see as small (~20 seat) stretch of the 223. Not sure what development of an 225 will cost but can’t be mega-bugs if MTOW stays close to that of the 220-500 with range ~2500Nm (typical MD’s range)? Exactly. The grand slam home run for the players involved in this (BBD and AB) is the 225/227. For AB or BA to create a NSA in 2-3 lengths, it would cost them 20 Billion minimum. The MD-81-88, minus the 87; plus the MD-90, show 5 across seating is doable and desirable. After Delta starts flying the 220-100 and possibly the -300, we’ll have a pretty good idea of where things are headed. It’s been said by some on this site that there really are two single aisle planes in the future: The 5 across 110 – 160 dual class seating and the 6 across 150 – 230 planes. Should be interesting and beneficial – especially in light of Delta’s recent announcement of not trying to shoehorn any more rows into da planes! Don’t forget the 7 across twin 797! What happens to the type designations for these planes? Heretofore, the CS100 and CS300 have been indicated as BCS1 and BCS3 respectively by ICAO (per https://www.icao.int/publications/DOC8643/Pages/Search.aspx), and apparently CS1 and CS3 respectively by IATA (per wikipedia). Do these stick, and thus forever cement a little bit of history, or will they get changed? Most narrowbody flights are short range with minimal hold baggage, so perfect for the A220 500.Why wouldn’t AB want to sell the airlines something that they need as long as they can produce it cheaply enough?If the A220 programme is to be a success, AB and its partners need to invest heavily in production improvements,therefore the 500 is essential to provide the necessary volume. The A320 is a different product and needs to move up a size for it’s next iteration/replacement anyway. Or are AB just going to order the airlines to buy a lard bucket that they don’t really need?This would be the same sort of arrogance Boeing used in their case against the C series, the airlines must buy 737 700s. I hope they changed the name of the joint-venture by now (CSALP). this was guaranteed the moment the AB/BBD deal was announced. It can only be BEAR if you live in Canada or Alaska! It goes back to looking at route and I followed one that had a 737 that flew two very short legs. Didn’t follow it further. I don’t know if it just works better to have Trans Con range so you don’t have to worry about it or?????? Delta is an odd ball in the range of stuff they operates. But, the CS-500 might need a new wing or a wing mod to get up to 180 seat competitor and at least 3400 mile range. Its still better than an all new program that Boeing really needs to do that I don’t think the E2 line solves for them. No, I converted those numbers into km .We Brits still think in miles. Part of the reason why I converted into km ,was that I am not certain if the numbers I read are miles or NM, perhaps someone can help me out? I can’t remember ever flying more than 1000 miles in a narrowbody. As a rule of thumb, a flight of 1000 nm would have to take around 2,5 hours in a narrow-body. And you’d have to fly 1 hour extra for every 500 nm further (if we’re being precise that’s the number for wide-bodies and 450 is more accurate for narrow-bodies like the E190, A220, A320 and B737). I’m not sure where you are located but here are a few common narrow-body routes that are well over 1000 nm as examples. North America: transcontinental, for instance JetBlue New York to Long Beach (LA area) JFK-LGB 2142 nm. Europe: flights to the Canary Islands, for instance from Amsterdam Transavia AMS-LPA 1718 nm. Southeast Asia: AirAsia Bangkok to Bali, DMK-DPS 1608 nm. More or less 3.5 hours from Anchorage to Seattle, another 30 minutes to Portland. 1500 air miles (but often maneuvering to the South to land North) – done all the time. Well over 1000 miles Seattle to LA. Aviation like sea travel is done in NM. Probably has to do with the standards of distances across longitudes. Me, I would like to see it all shift to KM and stop the nonsense but I am a voice in the Wilderness. It does muck with the brain when most of us use statue miles or KM (most of the world) and they are using NM. Guys: Read the article in the air transport section of ainonline.com. The AB people seem to be firmly positioning the two current models right below the A319 without much wiggle room for expansion or overlap. Maybe they won’t develop an A225, but if they do, they’re going to keep saying that they won’t right up until the announcement. Why cannibalize sales of the A319 with speculation until you’ve committed to developing the alternative (A225)? Of course they are. You sell what you got. Customers will determine the future of the A319. My bet is it will be discontinued within 2 years. To be honest I can’t see the 319N making economic sense anymore and airlines wanting it in big numbers, the 320N is effectively replacing it. AB can tweak the 320N with an HP model with higher MTOW, higher thrust engines, more range, etc. Can see an A220-500 with ~150 seats and ~2500Nm range potentially becoming a big seller. Tweaks required for an A225 could be applied to the A223 that will give it similar range and H&H performance as the 319N. Hi Bjorn, could the A320-family flight controls be adapted without “major” costs that pilots can get a common type rating for the A220-A320 families? I think, more likely, Air Bus will produce A220-500 probably 7 – 8 years from now, when they exercise the option of buying out the CSLAP! BBD has confirm some years ago that with the current wings structure, CS300/A220-300 can be extended to A220-500 or something similar. (https://www.flightglobal.com/news/articles/bombardier-confirms-cseries-wing-could-accommodate-l-427129/). It would be a small (and quick) investment for Air Bus, and the ROI would have very high potential. For the same segment of single aisle, they’d have 2 fabulous products to offer (A320 & A220-500) while Boeing has only one! Boeing would be in the hot seat, since the 737 is at the end of its stretching, and cannot be stretched much further, the E195-E2 that they’ve just acquired is not in this league! To stay competitive, they would have to offer the 737 much cheaper, and/or come up with a new design. I am seeing some apples and oranges here, the 737 wold need to shrink (and economically which can’t be done) to be in the C or E2 series area. Boeing going to have to do the Y3, its just a matter of when and what. The E2 sort of holds the fort though the Jet Blue loss says its not going to in all cases and particularity as Jet Blue operate E series that is a telling blow. But the E2 will be available and the A2XX not in any numbers for a while. So the E2 may see sales as its available and reasonably close vs its the best. As the 190 is under scope, that is an area the C can’t play in. >As the 190 is under scope, that is an area the C can’t play in. I don’t understand the E2 family. It does not know if it wants to be a family of regional jets or a mainline jets. They kept the narrow 4 wide fuselage giving them a “regional” feel, but then made all too heavy for US scope clauses cutting themselves out of half of that market. The A220 can also have an ACJ version in the future.